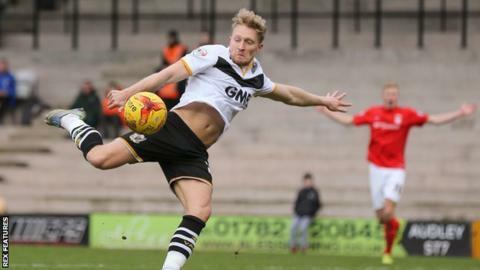 Striker AJ Leitch-Smith says he is hoping he can rediscover his best form in the final six games of the season to help earn a new contract at Port Vale. Leitch-Smith, 26, is Vale's top scorer with 11 goals this season and returned to action in Monday's defeat by Barnsley after four games out injured. His existing deal with the League One club runs out in the summer. "Hopefully I can string a few games together and get some goals," Leitch-Smith told BBC Radio Stoke. The former Crewe forward signed a one-year contract last July after joining from Yeovil Town and after going goalless in his first 16 games of the season, he scored 10 times in his next 14 matches. A hamstring injury has hampered him in recent weeks but Leitch-Smith is delighted to be back. "I'm obviously not as sharp as I could be but that will come over the next few games," he said. "I think my season's gone pretty well but I'm always looking to do better and build on things." Vale still have an outside chance of making the League One play-offs, with an eight-point gap to the top six with six games left to play.